Mit der Wiederveröffentlichung von Descent (ACR 1024), dem ersten Solo-Release von PBK 1988 als C-60 auf dem eigenen Label PBK Recordings, dankt Emerge nicht nur einem wichtigen Inspirator und Motivator, Attenuation Circuit rekapituliert damit auch die Hochzeit des US-amerikanischen Tape Undergrounds. An diesem Paradebeispiel für Noise Ambient wirkten nämlich neben Philip B. Klingler (*1960, Flint, MI) auch noch der Generations Unlimited-Macher Dave Prescott mit und mit Stanley Keith Bowsza (1951-2010) aka Minoy eine legendäre Gestalt, die immer wieder auch neben If, Bwana und Zan Hoffman auftaucht(e). Für Al Margolis etwa klang Stockhausen wie Minoy, nicht umgekehrt. Klingler kam von der Malerei her, seine Sound Art war die Fortsetzung von Abstraktem Expressionismus und Surrealismus mit anderen Mitteln. Der massive Kreationsschub Ende der 80er/ Anfang der 90er, inklusive Kollaborationen mit Zan Hoffman, Vidna Obmana und Asmus Tietchens, kulminierte rund um einer Lebensphase in Puerto Rico (1992-96) in mehreren Veröffentlichungen auf ND und RRRecords und weiteren traumtheoretischen Arbeiten und Kollaborationen mit Artemiy Artemiev, Artificial Memory Trace und Government Alpha im immer wieder neuen Headmix von Mescalin und Electronica. Descent verband 1988 pulsierende und thrillend orgelnde und jaulende Sounds von Modularsynthesizer und Moog mit hinter dem Noisevorhang unverständlichen Vorträgen ('Desire'). Auf der titelgebenden Rückseite mischen sich Sirenenglissandos und klagende Loops mit Geheul von Minoy. Ein ständiges motorisches Grollen wirkt dabei als eine gewaltige, wenn auch vorüber ziehende Bedrohung, die jedoch als ein Fauchen und wieder giftiges Glissandieren weiter über dem Froschteich lastet, über dem zuletzt alarmierter Klingklang läutet, bis zum Ausklang mit Screams aus einem alten Holywoodthriller. Für Geheul gibt es aus der Froschperspektive immer gute Gründe. Descent was PBK’s first solo album and is the first in a series of re-issues that the Attenuation Circuits label will be putting out. PBK is Phillip B Klingler who originates from Flint in Michigan. He started out as a more visual artist but slowly gravitated towards music and started working as PBK working together with Minoy a well known name from the underground tape scene. Descent features appearances from Minoy and also analog synthesist David Prescott (who ran the Generations Unlimited label) who had a large modular synth that was put to good use on this album. Descent consists of two tracks the first (the 30 minute long)Desire is based around a fast moving arpeggio type of sequence that the rest of the sounds have to fight with or fit in with. Sometimes they work and at others they don’t. It’s more of a collage than a developing piece of music as the basic sounds are omnipresent and other pieces come and go adding to the piece rather than moving it to somewhere else. You get a whole mixture of things from vocal samples to analogue filters to field recordings. You get the impression that this might have been recorded in one live take as there are elements here that perhaps shouldn’t have made the final mix and a few sounds that really detract from, rather than add to, the overall feel. Generally these don’t outstay their welcome and get replaced with other more complimentary noises and sounds. The 2nd piece Descent (another 30 minute track) is pretty much in the same vein as Desire though perhaps with a slightly more ambient or industrial feel and with more space to it. It’s a more accomplished piece than the first and it would be useful to know how much time there wass between recording both pieces. Descent has influences from TG and SPK firmly in there but also has its own little unique touches that make it more than just a homage. For a first solo album Descent has plenty of strong points and it’ll be interesting to see what parts of PBKs extensive and varied back catalogue Attenuation Circuits decide to reissue. DB. PBK (Phillip B Klingler) is huge, a tape artist phenomenon with household name recognition that inspired many with its authentic sound of audio art and mystery. One of the influenced admirers was the label owner of Attenuation Circuit, a record label certainly not unfamiliar with sounds that are inspiring. You can imagine that now that PBK had somehow flew itself onto this very label, something PBK did with a very descent sounding rerelease named (what a coincidence) ‘descent’, that the label owner must have felt very similar to a young Michael Jackson fan meeting Michael for the very first time in ‘NeverLand’. Exciting! It simply doesn’t happen every day to meet and work with someone you look up to. Perhaps if you are fairly short it would have been a different story, but the fame and glory of the legendary PBK is pretty much larger than life & that is pretty large. The ‘Descent’ release that clearly dazzled the owner of the Attenuation Circuit label into a fanboy who is standing ready with a autograph book and exciting butterflies in the guts, is not a crazy act. The music is indeed something you (and other people) would lick your lips for. Two sessions of slightly more than half an hour are there to please the ears. 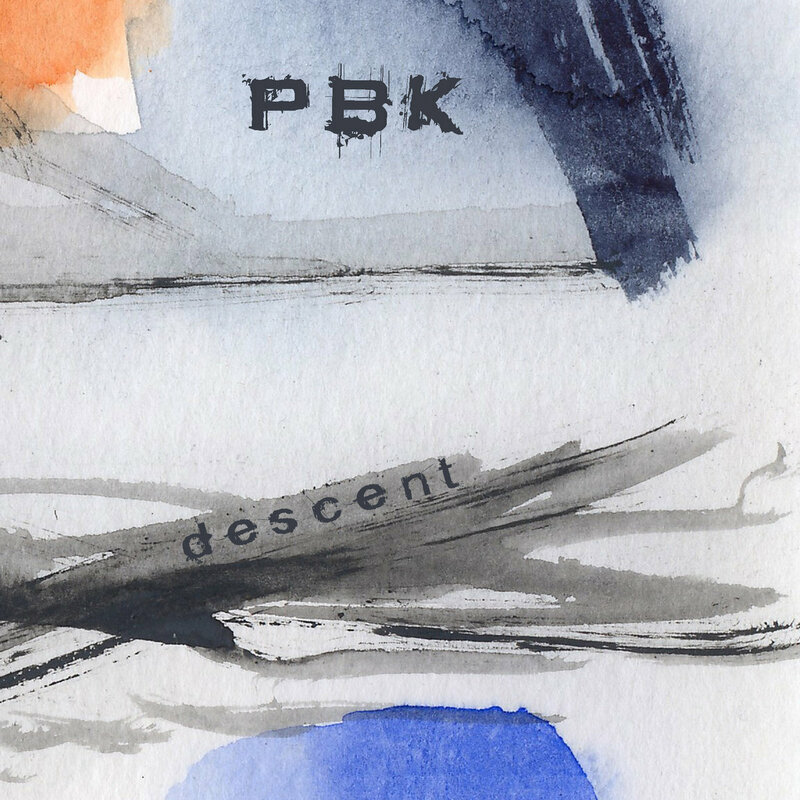 You might have heard it long time ago, as it is in fact a re-release of PBK’s first solo album. But it doesn’t matter if you have been familiar with this famous tape hero from the eighties, or are completely new to it; as one will be happy to rehear and the other would be happy to hear it for the first time. It’s a win – win situation, really. Music wise it’s of course high up in the highest standards. Two atmospheric pieces that are very original; the vintage synthesizer sounds are the true leader over here but also how they are actually played & the additional adding of other sounds gives this work a fine depth. Personally I felt it like walking through a enormous art gallery, a place in which little groups talk while they stroke their chins and look intellectually pleased with all the artworks on the walls. It is definitely not only artworks on the wall, but more a ‘multimedia’ art exhibition that I feel this music is taking me. Wandering around while these two synthesizer friendly works build the right climate and atmosphere. It’s great to hear as it takes you away to a place that feels like its one with lots of things to see and hear; and you don’t really need to step around but just relax and hear it with your own ears. Modern museum visiting for people who don’t really want to go, but still want to hear the soundtrack to it all.